Victorious in the Mexican-American War (1846-1848), the United States acquired California and New Mexico. A year later, gold was discovered in California, luring hundreds of thousands of people across the plains. However, the new territories resembled distant colonies rather than parts of the republic. It took six months of hard, dangerous travel to cross the plains. The other options were sailing around South America or sailing to Panama and crossing the fever-ridden isthmus. The government approved the construction of a transcontinental railroad in 1862, but construction was slow until the American Civil War (1861-1865) ended, when labor and materials became available. The Union Pacific, which started from the Missouri River, relied mainly on veterans, while the Central Pacific, which originated at Sacramento, turned to cheap Chinese labor. Paid in government bonds, both companies competed to lay more track and qualify for more bonds. 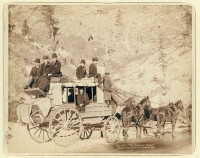 When the two tracks met at Promontory Point in Utah on May 10, 1869, a six-month-long trek by wagon had been replaced by a week-long trip on a train, thus linking the two sides of the nation.